Jim White on SSN nearly just exploded in orgasmic delight. To be fair I wouldn't get too carried away, 5 Live also reported we were in talks with Hitzfeld..
BBC Radio Newcastle also reporting this. His team conceded more than Newcastle this year....and look at our defence. When was the last time an NUFC manager lasted 3 years? Allardyce also believes that English football demands too much of its managers in comparison to other European countries. "The system in other nations doesn't give the same stresses as it does in England. Club statement in the morning then? Take it he won't actually start untill after the last match though, since they have all ready confirmed that Nigel will take over the final game. We conceded no more than Man Utd. It's a total myth. Damn! I never thought of that! 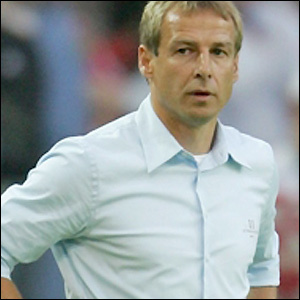 we could have had Klinsmann stood on the steps of his home saying WTF??!? With 3000 fans outside demanding why we sold Kieron Dyer? As someone says, we never actually conceded that many, not as many as Roeder's (bare bones) team, and nowhere near as many as Allardyce's this season. Worst goal difference in the top half Bolton. One of only 2 teams whose GD is negative. Without Owen we've scored 37, without Anelka's goals they'd be on 35. Obviously a replacement would be drafted in for Anelka and they'd have scored a few, but I think people are deluding themselves if they think the gulf between Roeder and he is that huge. Allardyce has had a good few years to sort Bolton out (which Roeder never got here) and they finished 16th and 17th before he was able to move them up to top half finishes, he'll not get that chance here.